Computer animated movies don't get enough credit. Sure, many of them are absolute garbage (like Star Wars: The Clone Wars or Space Chimps), but every so often you get a film that is so wonderfully fun and full of energy that it brings out the kid in you. Heck, I'm 22 years old and some of my favorite films and television shows are animated. There's just something about a good CGI movie that makes me feel like I'm 10 again and I love that. Lucky for us, Disney has given us Bolt, a completely original and charming 3D movie that everyone in the family will enjoy. The film follows young Bolt (voiced by John Travolta), who is the superstar of his very own television show where he protects his owner, Penny (voiced by Miley Cyrus). The catch is that he thinks it is all real. He is completely unaware that he is on television and lives solely to make sure Penny is okay. At the end of each show, he always thwarts the bad guy and saves Penny, but thanks to recent low ratings, the boys in charge decide to end on a cliffhanger where Bolt loses Penny. Since he believes she is in real peril, he breaks free of the set and goes on an adventure to try to find her. As far as I'm concerned, there are two things that can ruin a CGI movie: the voice acting and the animation. For instance, Madagascar drove me crazy because every time somebody spoke, I heard their real life counterparts rather than the characters. Every time the lion said something, I heard Ben Stiller. Every time the zebra spoke, I heard Chris Rock. It was very distracting. Just as well, a movie like Valiant can look incredibly drab, to the point where I'm too focused on the poor animation to give a crap about what's happening. This is where Bolt shines. It may not be fair to compare every CGI movie with Pixar because they are masters of their craft, but they've set the bar high and most films can't reach it, Bolt included. However, this may be the prettiest non-Pixar computer animated movie I've ever seen. It's no Wall-E, but the stellar visual style along with the heightened 3D experience makes for a visually stimulating good time. Unlike Madagascar, I never felt like the actors were getting in the way of the story. John Travolta and Miley Cyrus spoke their lines with gusto rising above their recognizable voices and gave the film a feeling of its own. But it's not just those two. Susie Essman and Mark Walton are terrific voicing Bolt's friends Mittens the cat and Rhino the hamster. Even James Lipton of "Inside the Actors Studio" creeps in there with some believable and humorous lines. I can't praise the vocal delivery enough. It was phenomenal. Part of my affection for the film comes from the fact that it is undeniably cute. I mean, just look at that picture up there. Is that not the most precious thing you've ever seen? (NOTE: If you answered no, you have no soul.) I fell in love with these characters because of their surprising cuteness. In fact, the opening two minutes may very well be the most adorable thing I've ever seen in a movie. Now I want a puppy. Something to note is that although 3D will soon be a cliché due to the insane amount of upcoming movies utilizing the tactic, Bolt uses it properly. Instead of throwing things at your face non-stop, it exists only to enhance the experience. It wasn't used as a gimmick, which I loved. I hope that future films will take note of this more effective usage. All in all, Bolt is a solid effort that I thoroughly enjoyed. The only real problem with the movie is that it's not a gut busting hilarious movie by any means (although Rhino is awesome). Still, it does have some good chuckles here and there, enough to keep you satisfied. It's a movie that I would love to see some sequels to. A film like Wall-E is perfect the way it is and doesn't need any sequel to tarnish its beauty, but Bolt was a fascinating, fun, and very entertaining character that I could easily see partaking in further adventures. Animation isn't just for children anymore. 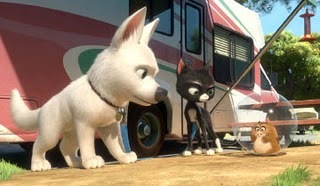 Bolt is a terrific family film that I recommend wholeheartedly. I am ready to make this for the next kids party!